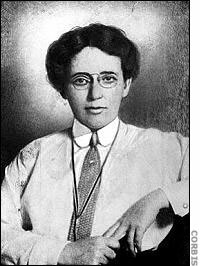 A woman who saved thousands of infants' lives in the city of New York was born on this day in 1873. Public health worker and doctor Sara Josephine Baker dared to go into the homes of tenement dwellers in the city's Lower East Side to bring health education to the people who needed it most. She taught immigrant and poor mothers proper hygiene and sanitation methods, provided prenatal care and nutrition, and even introduced the concept of baby clothes with front openings to reduce the potential for suffocation, which was a leading cause of infant mortality. With her work, New York City's infant mortality rate became the nation's lowest, dropping from 144 out of 1,000 cases per yer in 1908 to 66 out of 1,000 per year by 1923. 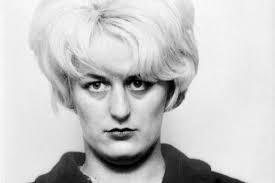 On this day in 2002, Myra Hindley died of a heart attach at the age of 60. 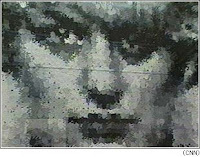 Hindley is attributed with committing the most painful crimes of the 20th century. On 6 May, 1966, Hindley and her lover, Ian Brady, wee both jailed for life for the murders of Lesley Ann Downey, aged ten and seventeen-year-old Edward Evans. Brady was also found guilty of murdering John Kilbride, aged twelve - a crime in which Hindley was convicted of being an accessory. They became known as the infamous Moors Murders, after the bodies of the victims were discovered in shallow graves on Saddleworth Moor near Oldham. The public was shocked, not only at the age of those killed, but also at the age of the murders themselves. Hindley was just 21 at the time of John Kilbride's death. The betrayal of innocence that these crimes represented caused the media to cast Hindley and Brady as incarnations of pure evil, and Hindley especially was entrenched as a hate-figure with British society when in 1995 a portrait of her, constructed from the imprints of children's hands was displayed at the 'Sensation' exhibition in London. In Japan, Shichi-go-San, a centuries-old Shinto festival, is performed annually on this date. 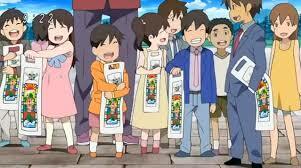 Also known as the Seven-Five-Three, it is a huge birthday celebration for children who have reched these ages. Parents take their youngsters to local shrines for the blessings of the gods and goddesses and candy decorated with symbols of good fortune.